The PV manufacturing sector has seen sustained profits and stable growth for several years now. However, research shows that it is now in the state of overcapacity and most solar PV producers are facing difficulty trying to balance their accounts. GTM Research thinks that much more consolidation is on the way, and that the global PV module landscape is headed for a significant transformation. Some of clear indicators of this are - plant closures, market exits and insolvencies in the past year and a half. 1. Market exit or plant closure will continue to happen to firms with facilities in high-cost locations such as in Western Europe and the U.S. By 2015, module facilities in high-cost locations are expected to make up just 9% of global capacity, compared to 32% in 2009. 2. 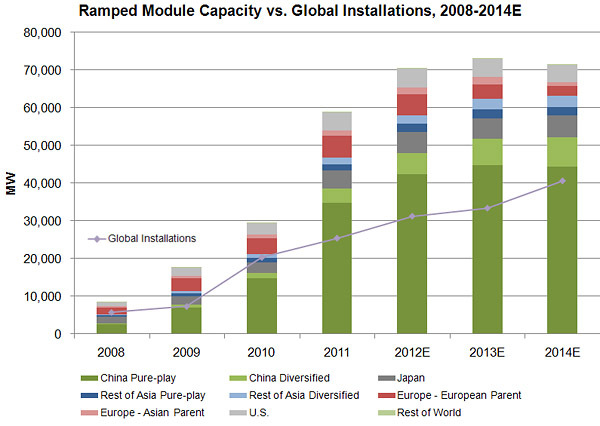 By 2014, it is expected that thin film will make up less than 5% of global module capacity, compared to 19% in 2009. Three suppliers - Hanergy, Solar Frontier, and First Solar - will make up 92% of the installed thin film base. 3. Aggressive downstream build-out in China: The large pure-play firms and diversified firms are likely to be awarded with module supply or EPC contracts for several large, multi-hundred-megawatt projects on account of their workforce and government connections. 4. Some of the struggling Pure-play Chinese firms will receive additional debt from domestic Lenders to allow them to service their near-term debt obligations, stay solvent, and maintain employment. 5. Large Chinese firms will continue to acquire European module companies. We have seen Asian firms acquiring established but embattled European module suppliers such as Sunways, Scheuten, Q-Cells and Solon. This trend is expected to continue. 6. Some Pure-play Chinese firms could be acquired by State-owned Chinese firms. There are natural synergies to be gained from the acquisition of certain pure-play Chinese solar firms by larger diversified Chinese firms. 8. Larger diversified firms (such as LG, Samsung, AU Optronics, Sharp, Panasonic, Bosch, and Saint-Gobain) could be forced to exit the market. They need to decide whether to cut their losses, or to continue to compete by differentiating substantially and aggressively in terms of their product or business model. Well the solar PV can be unpredictable and in 5 years' time these expectation may not be even relevant. But we'll see. Actually, even the so-called 'expert' in solar PV can't really tell what will happen in 2 years time. last year it was RM15,000/kWp at the beginning of the year. By year end the cost was just over RM10,000.